Posted in: Novedades Editoriales. Tagged: feminist discussions, Feminist Review, Frailty and Debility. 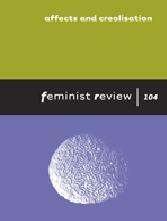 Feminist Review issue 111 on ‘Frailty and Debility’ is now published! The issue converses with feminist discussions of embodiment, affect and care through an engagement with the concepts of frailty – be it bodily or cognitive – and debility. Both concepts provide a means of thinking critically about the production of abled-bodies and notions of capability. The Issue critically considers the materiality and affectivity of disabled bodies and some of the ways in which impairment, disability and frailty complicate existing feminist and queer scholarship, creative practice and activism. Ver aquí su contenido y link de descarga. The ‘Affect and Creolisation’ Feminist Review Special Issue addresses questions concerning the legacy of plantation culture, focusing on its shaping of a gendered creolisation and affect. The essays consider ways in which creole textualisation allows for an enlarged discussion of the Creole transnational, including an interrogation of gendered bodily affectivity and agency. The issue raises questions about women’s bodies: are Creole women’s bodies haunted by memories and legacies of a traumatic history of Atlantic slavery and what meanings does this past hold for the present? In their interrogation of the gendered legacy of the plantation, this collection of essays invigorates feminist theorising of the affective.